This also has implications for backups and database cloning with RMAN. It would have been nice if the nologging had been an option, or was more heavily flagged. So..David, are you saying that the PeopleSoft applications will not run on a Logical Standby Database? PeopleSoft will run on a physical standby, but you must force logging, otherwise some objects in your secondary database could be corrupted. Similarly, you can use logical standby, but unless you force logging, you may not replicate all data to the secondary database. Indexes created NOLOGGING are not going to be a problem because the DML is reapplied, but any use of INSERT /*+APPEND NOLOGGING*/ might be. My understanding is that a PeopleSoft app needs to be able to write to the database in order to run. Do you also happen to have any metrics on how much of a hit you take by forcing logging? Apologies, I didn't phrase that very well. I meant whether you could the standby having made it the primary. You are quite right. 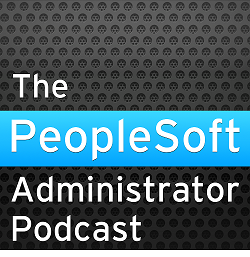 If you only open the database read-only, you will not be able to run the PeopleSoft application. I have a Peoplesoft 8.1.7 database that is being kept around for legacy reasons and wanted to know if there is a way to make the database or application read-only... I tried setting the DB to Read-only only to find that PS will not run. I see some objects outside of Peoplesoft product schema have NOLOGGING there in a Peoplesoft database (like some of SYS or DBSNMP tables). If I use FORCE LOGGING option, would it impact the system level operation? The NOLOGGING option at object level only applies to certain operations. Most DML will still be logged. In my 10g database, all but three of the NOLOGGING tables are also temporary. Redo is not generated for DML on Global Temporary tables. FORCE LOGGING is a database wide setting, so I would expect it to apply also to these three tables. From Oracle documentation, Logical Standby doesn't support certain data types (collections, User-defined types, etc). Does PeopleSoft use any of these types? It doesn't support certain DDLs. I am wondering if this would prevent us from implementing a logical standby for a peoplesoft database. Your comment would be greatly appreciated. Thanks! PeopleSoft does not use collections or any user-defined data types when running on Oracle RDBMS. I don't think it issues any unsupported DDLs. I see no reason why you couldn't implement logical standby for a PeopleSoft system. We have a Finance 9.0 running on Logical Standby database. At times we have skipped UPDATES on TAO tables to mitigate a SQL Appy stuck situtation and as approved by functional team. However we wanted to undertand the impact of this on the Application tables that load data by using these TAO tables. Users have not reported any issues , however being a pro-active DBAs we wanted to understand if this causes any bad data on the replicated site.